The oldest depiction of Bad Rumestluns is located on the altarpiece in the baths’ former chapel. An original, miniature depiction of the spa bath is painted between the wasting bodies of invalids, who gaze beseechingly at the image of the Virgin Mary with the Christ child. However, the earliest date from which the sulphuric pools have been in use is unknown. The oldest document in which it is mentioned for the first time is dated late, after the destruction of the bathing house buildings at the end of the 18th century. 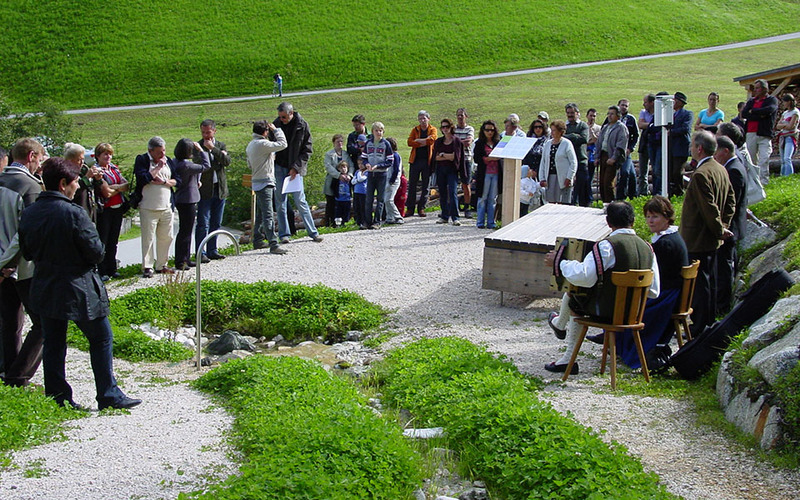 For much of history, this spa site, originally intended for the use of the local peasants and farmers and located south-east of Wegen near the river known as ‘Rü da la Gana’ in the local Ladin language (in English: ‘the river of the wild woman’), was a popular socialising spot for the local Ladin population. The steam baths in particular became famous. These were very different to modern notions of steam baths: they were constructed as large wooden boxes in which a person would sweat, with their head poking out through an opening in the top. This process was thought to cure rheumatism. At the start of the 19th century, the location attracted around a hundred guests taking the waters, many of whom hoped to cure themselves of scabies (a rash). 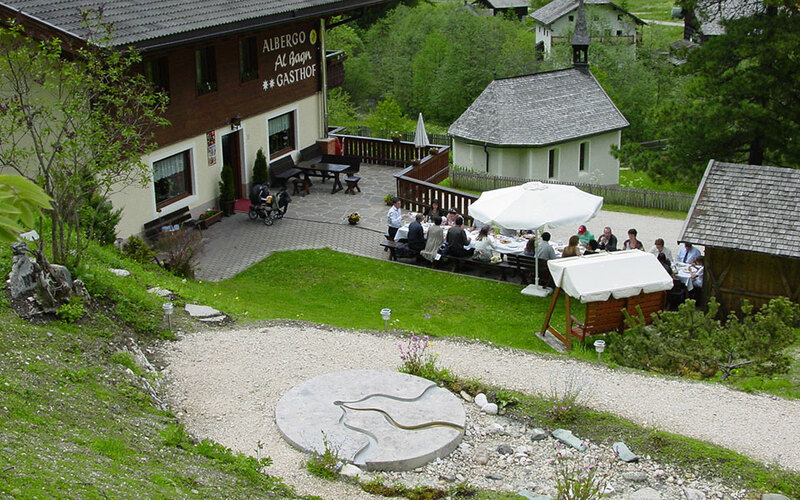 The spring waters have their source under a tree just above the site of today’s Gasthaus Bad Rumestluns. Before they reach the surface, the waters trickle through the conglomerates of the Buchenstein valley’s layers of bellerophon chalk. This elixir is a whitish colour and tastes and smells of hydrogen sulphide. The stream was diverted to the bath house for the bathing and drinking cures, which, among other things, provided prophylactic treatments against erysipelas, arthritis and loss of appetite. IIn 1896 the bath house burned down, together with its courtyard and chapel. The local population did not lose heart, however, and just a year later a new bath guest house had been built, with ten rooms and bathing chambers. The new buildings also included a single-storey front house with a cellar, lounge and kitchen, plus a veranda, which also served as a dining room for the guests, and several brick and wood-panelled rooms. The new infrastructure was complemented by an additional single-storey rear house with bathing cabins and wooden rooms for the less wealthy visitors. A path led through both buildings, which ended in a spring room at the far end of the rear house, where the fresh, curative waters flowed continuously. The bathing buildings were improved and extended again during the interwar period, while the modern chapel, in which cured guests would leave their crutches and walking aids as votive offerings, was constructed a little way below the guesthouse. For several years after the First World War, the spa was a popular location for famous celebrities. Although it has always been frequented most by the local population, many foreign guests have also flocked to Bad Rumestluns. The most famous of these was the nuclear physicist and Nobel Prize winner, Dr Max Planck. During the Second World War, soldiers arrived, but not to plunder the place – instead, they came to bathe in its waters. Bad Rumestluns is also mentioned in Luis Trenker’s book "Mountains on Fire". As a result, the romantic area around Rumestluns became an even more attractive destination. After radical restructuring in 1978, the operations of the spa baths came to an end, while the hospitality business continued. 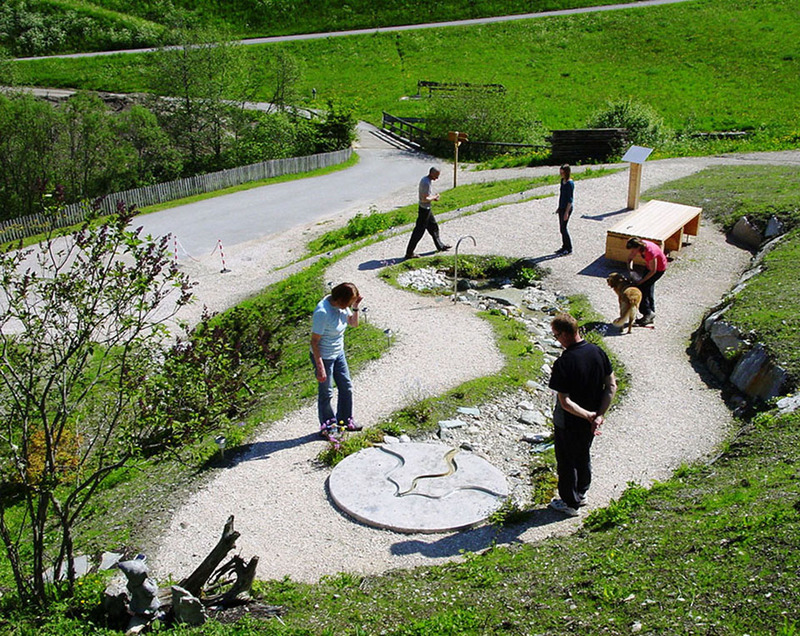 Now and then, visitors still come to sample the water, and the owners of Gasthaus Rumestluns continue to maintain the source of the waters and its spring.